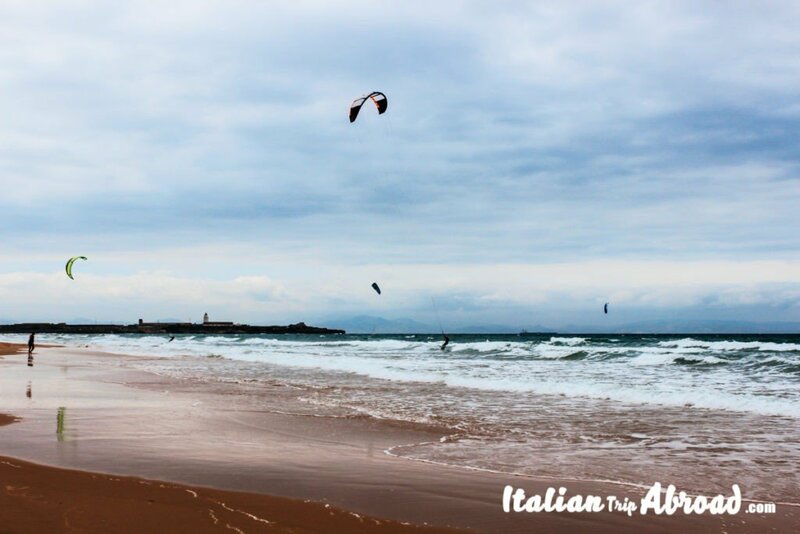 Discover Andalusia in Spain, without pay a visit to Tarifa is the worse things you can do. Between Malaga and Cadiz there are amazing beaches, but one, in particular, is the best. 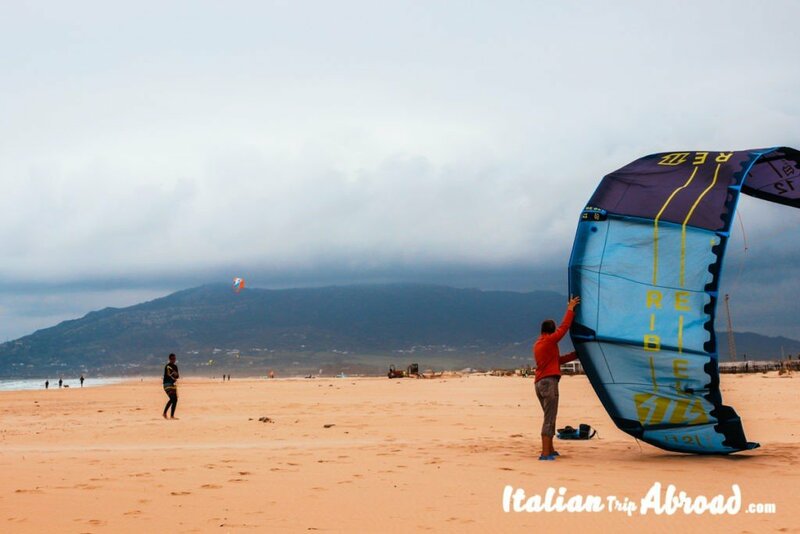 You will know this place for many guides about kitesurfing in Tarifa, watching on the other side of the sea, where your eyes can see the Moroccan’s coast. Visit Tarifa is one of the best things to do in Costa del Sol. A piece of Spain and Europe with over 300 days of Sun. 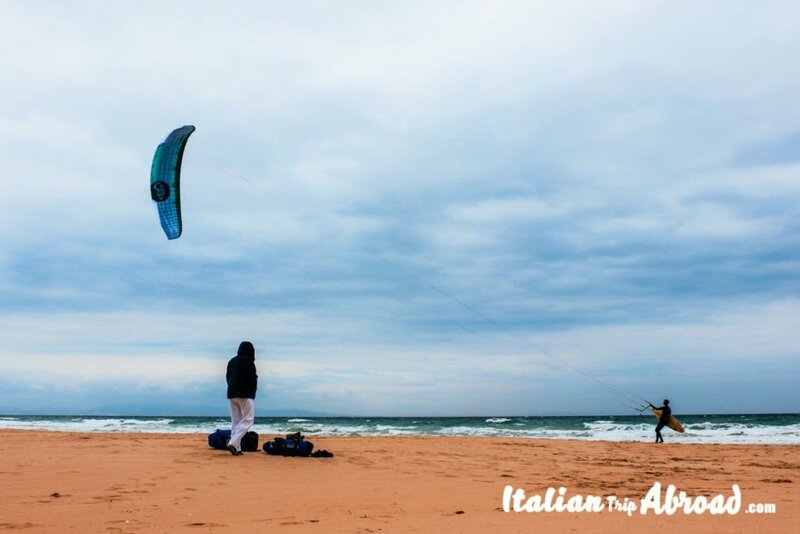 The best kite surfing schools are here in Tarifa, thanks to the weather conditions. The contingence of the Mediterranean Sea and the Ocean, make this place the ideal to learn and improve your Kite Boading Skills. Maybe you have never listened to this word before, or at least you have never pay attention to it, associating it to the more classic surfing. It is not that far from the surf, that is using a classic table for a stay on the top of the waves. Kitesurfing is a wind-powered watersport, it is not possible to do everywhere, but just where the weather condition is ideal for it. Despite the classic surfing, that needs to be on proper waves. The Kitesurfing doesn’t need wave surfing, it can be even on mirror-flat lagoons. All you need to practice this amazing water sport is just wind and water. 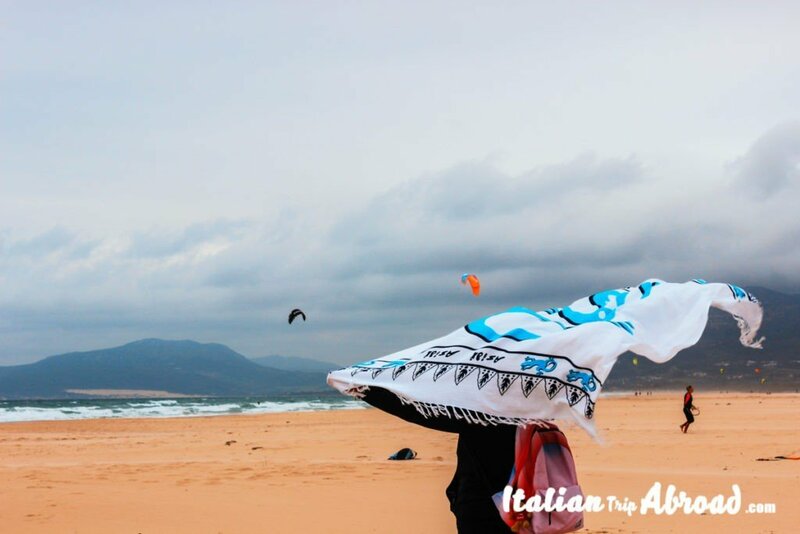 Kitesurfing in Tarifa is the ideal for this sport, you will have the best even if you are a beginner. Kiteboarding is one of the youngest board sports. It was already known in Hawaii 30 years ago. 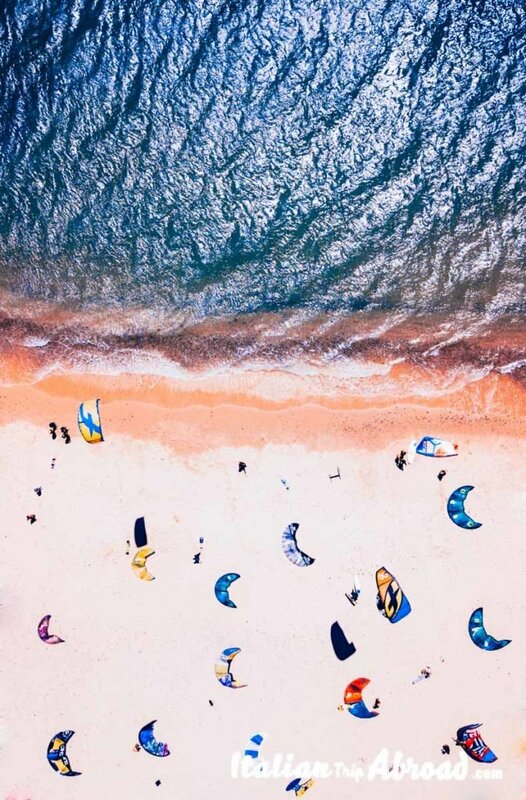 Basically, Kiteboarding and Kitesurfing are the same sport, it is easy to find people talking about watersports and change the words in the conversation using both. For some people it is not the same, Kiteboarding is more extreme of the Kitesurfing. The first it is meaning even great skills on maintaining the downwind, the second is the based on the skills to surf on the water working on the upwind. You don’t know how to manage the wind on a surf table? No problem. In Tarifa, there are a lot of Kitesurfing School that you can have your private Kitesurfing lessons. 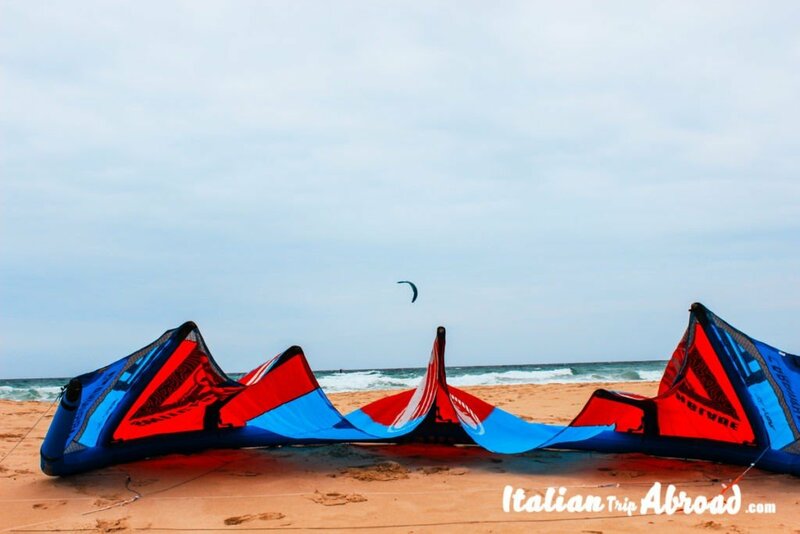 There are also many instructors that are doing free public lessons on the beach, those are so crowded, that’s why we suggest going directly to a kite surfing school close to the beach. 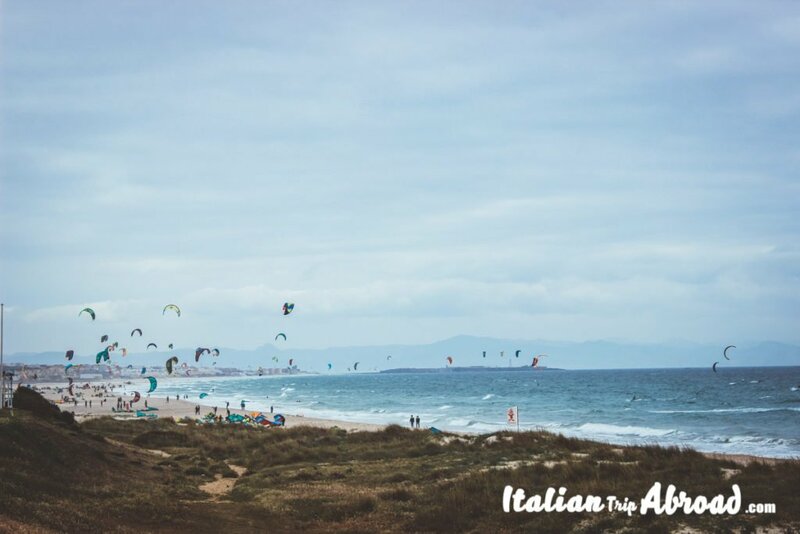 Just going up and down the beach of Tarifa, or as local language La Playa de Tarifa, you will see a lot of Kite Surfing Schools. 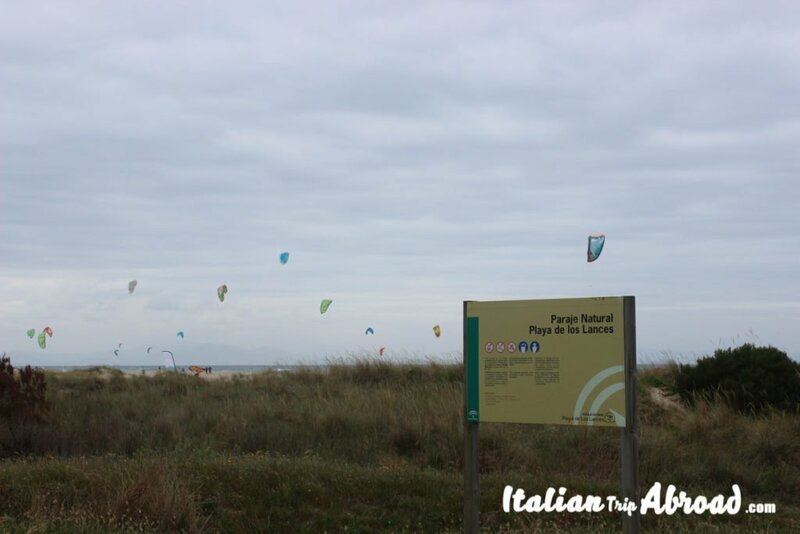 Those are everywhere because one of the main tourist attraction of Tarifa is Kite Surfing. Even if you don’t know how to use a board, and how to manage the wind. You will enjoy the people that are doing that. There are a few spots really well known by locals and frequent visitors. They meet there for a beer and food before starting the daily session of Kitesurfing. One of the most known spots is at the Waikiki bar. Another famous area is really close to the sporting area of Tarifa, here there is a free parking space, just before the entrance to the seaside. Going in direction of Cadiz, on the Carretera National N-340, there is Playa de Los Lances Norte. This is another famous area for kiteboarding, with some of the best instructors of kiteboarding and performers showing the skills. Going Though this road, you will see the amazing rural landscape. There are many directions to narrow beaches. We suggest entering in one of those narrow and dirt streets, going down reaching the beach. Point your direction to the Waves Beach Bar, it is a Chiringuito, a typical kind of bar on the beach. This is the right place to find the wildest surfers. Tarifa is totally on the coast. There are several beaches along the Coast of Tarifa. Four beaches are the best and you have to pay a visit, from everywhere here you can see people Kitesurfing. Once you get in Tarifa, follow the direction pointing to Playas de Tarifa, those are the correct instructions to reach the beaches. Playa Chica is the most close beach to the town centre of Tarifa. It is easy to reach and is even easy to find parking space. Playa de los Lances is our favourite spot for kitesurfing and kiteboarding. We have discovered this spot by mistake. Once we took our way down to Cadiz, we found some direction to this Natural Reserve. We found the Paradise. Playa Bolonia is one of the most beautiful, becouse of that we have left this one for the last. This amazing beach is most made of dunes, that make the landscape more similar to the close Africa. It is one of the most popolur of Tarifa. The sea in this part is really clear, and despite the common thinking, the wind slow down in this part of Tarifa. 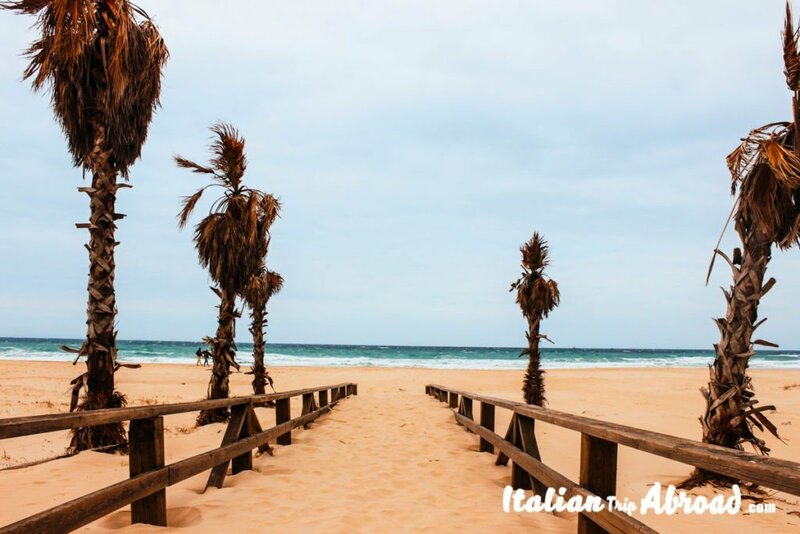 It is far away from Tarifa, and you will meet the first directions to this beach just on the way to Cadiz. It is nice to visit and say hello to the locals, the caw that love to stay on the Dunes of Playa Bolonia. Tarifa is the Southern part of Spain. It is between Malaga and Cadiz, really close to Gibraltar. It is in the Cadiz District but is just 160 Kilometres away from Malaga. 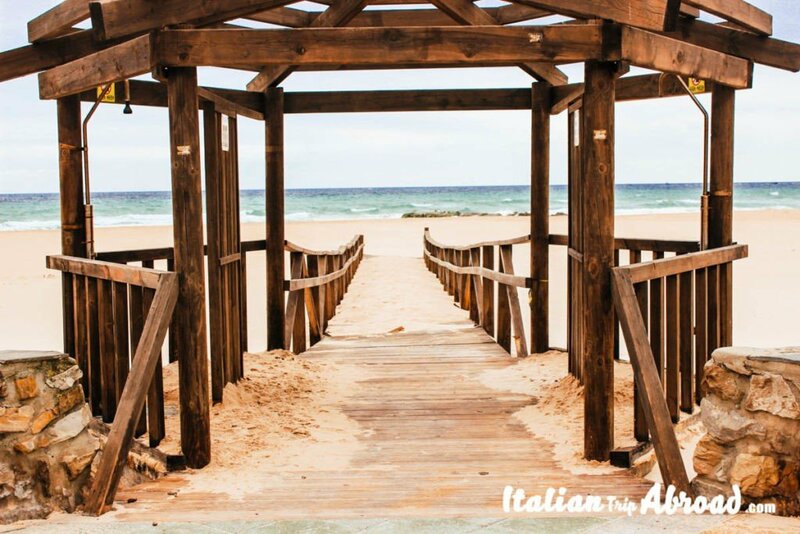 From Malaga to Tarifa you have to follow the seaside, a great view on the Mediterranean will guide you through the AP-7. Just 45 minutes away there is Gibraltar. The small state under the United Kingdom law is really close. 45 kilometers divide Tarifa from the independent state of Gibraltar. Cadiz is far just 1 hour follow the highway N-340, that will take you inside the countryside of Spain. If you want to stay on the seaside, you have to stay on the N340 and then continue on the A-48, that will be also your way back to Malaga. Tarifa is covered by bus from the TG Comes company, this is the perfect stop between Cadiz, the biggest city around and Ronda, the amazing white city on the top of the hill. To go to Tarifa and explore around, trying to don’t miss anything is highly advanced to rent a car. In Spain rent a car is not that expensive, and the direction is almost the same that is on the other European Continent countries. There is no train station in Tarifa, that make this place reachable just by bus and by car. 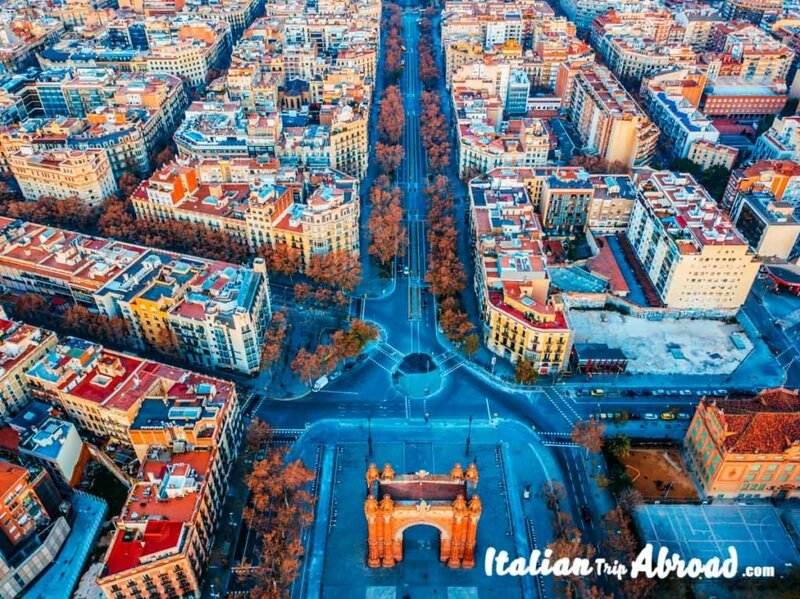 Do a Road trip of Spain is the best way to enjoy the landscapes. Do like us and explore the remote corners of Andalucia. As we said before, the way from Malaga to Tarifa is so nice. A look on the side of the carriage, where the Mediterranean sea meets Spain. Going to reach the Southern Point of Spain, is some part and in a clear day, you will be able to see the Coast of Marocco. From Malaga to Tarifa, you will pass amazing town and villages. Following the path on the coast side, you will see Marbella, the white houses of Torremolinos. Give a try to Gibraltar, most of them will say to don’t go, as it will be a waste of time. We have another opinion about, it is a great day trip from Malaga or Cadiz. It will give to you another aspect of how will be a United Kingdom lifestyle with the sun. You can reach Tarifa from Malaga in many ways. Train, the journey will take a bit longer because it will stop by all the villages on your way. But it is really nice to do. It is a kind of Road Trip of Andalusia. If you are not very fun of Train Travels, you can take a bus, that will take about 2 hours to reach Tarifa. The buses are running from early morning, with the last from Tarifa departing around 8.00 pm. There is a way to go from Malaga to Tarifa by bus. IT is not the best way and will take time. The route from Bus from Malaga to Tarifa can take up to 6 hours, and you have to change at least one bus. Instead, to do by Bus Malaga to Tarifa, we suggest taking a ride on BlaBla Car, that for 10 euro more or less, will take you to the destination. Check all the chances to go by bus from Malaga to Tarifa with OMIO. You have to change in Marbella, so, if you are staying in this town close to Malaga, try to check the timetable of the buses from here. There is a company that is running the services around the route of southern Spain, it is the TGS, go and check the timetable on their website. Easier is the route by bus from Cadiz to Tarifa. The journey will be even more short, that Cadiz is really close to Tarifa. As we said before, check the local bus company to see the time table and the bus stops. There are around four buses running the track every day. If you are going to reach Cadiz, why not to plan an itinerary to Seville. 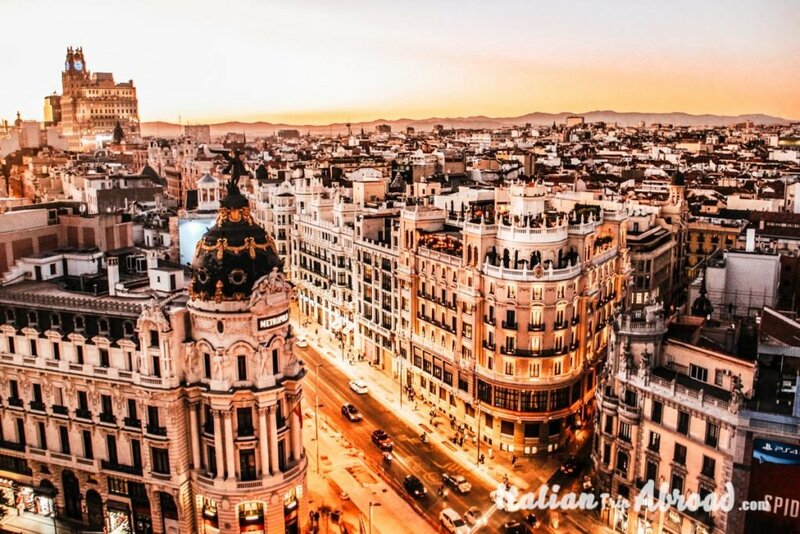 The Capital of Andalusia is a place you must not miss in your trip. Sevilla is amazing. Tarifa is one of the nearest points to Africa. Usually, from the beach of Tarifa, you can see really clear the coast of Marocco. This position of advantage given to Tarifa the chance to be the bridge between two different cultures. Thanks to this aspect of Tarifa, the little town of Andalusia is completely different from the other Spanish towns. From Tarifa is possible to take a Ferry Tangier – Tarifa. This is the main route of the interchange between the two countries. Tangier to Tarifa is the best way to visit Marocco from Spain, if you book your ticket in advance it will be even cheap. Check online the best options for you to reach the north coast of Africa. This is just one of the many things to do in Andalusia. 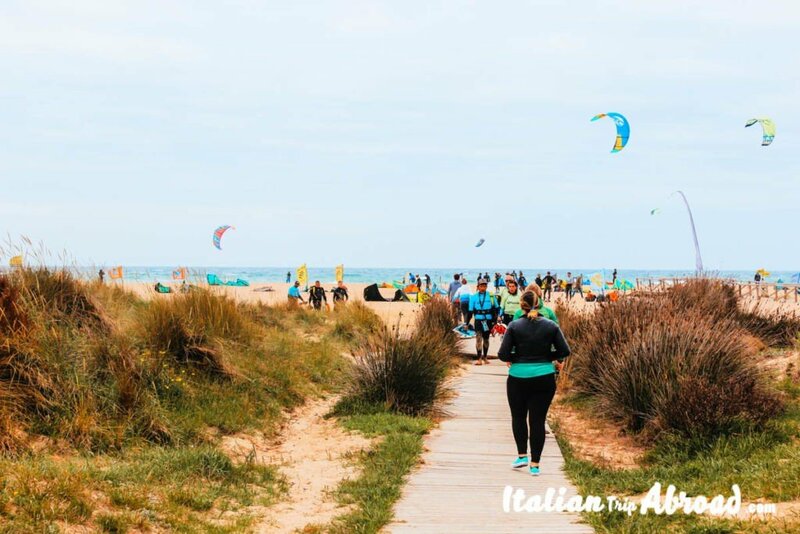 Tarifa is becoming well known as the European Capital of Wind and here there are some of the best beaches to practice Kiteboarding. While you can reach Tarifa from many points of southern Spain, it is the best place to become a proper Mecca of this sport. Andalusia is cheap and beautiful, so many people are relocating here, and many remote workers are deciding to stay in Europe and be based here. 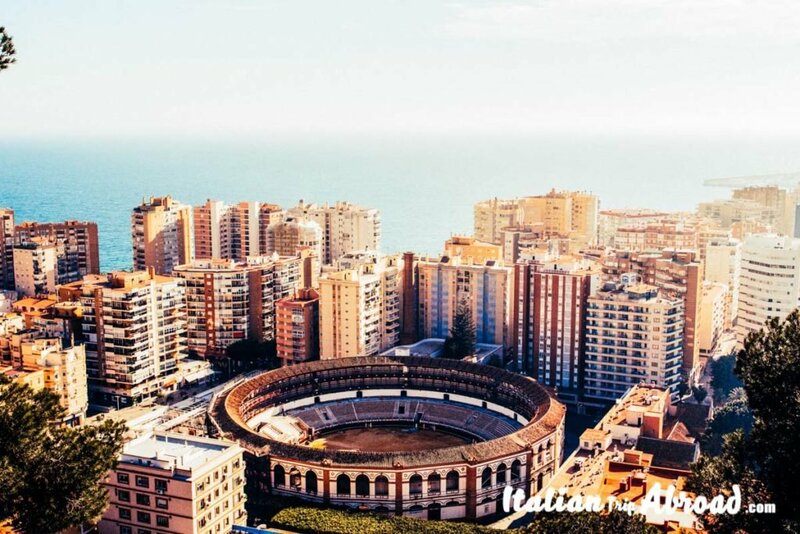 In Things to do in Andalucia, you cannot miss at all to visit Malaga and the amazing beaches. Put in your list to stay in Sevilla one of the best cities we have visited in 2018, where we will head back this summer again.